food related addictions can seem harder to change because they are centred around a basic human need. The reality though is that food is fuel for the body to function in daily life and, if we can remember to see it as that, change becomes easier. In food addiction, there is an emotional dependence or reward that forms a compulsive relationship to food. Whatever form your food addiction takes, be it an eating disorder such a bulimia, an inability to stop binge eating, a constant craving for carbs, or a sugar addiction, there’s a good chance I can help. Reducing and stopping cravings for binge foods. Ingraining healthy boundaries around what foods you eat and when. Skillful management and neutralisation of triggering foods and situations. Dealing with any unconscious patterns that may be driving your addictive behaviours. Gaining emotional stability that is not dependent upon food. Personalised Hypnotherapy MP3s to help you stay focussed and make progress between sessions. Self-help tools to help you take responsibility for the changes you want to make. Setting short and long term values and goals, and well as action plans to achieve them. 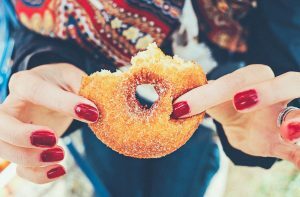 It has now been scientifically proven that just seeing certain trigger foods, such as sugars and carbs, can light up the reward circuits in the brain. Food Addiction is real, and can make even a simple trip to the supermarket a very difficult and challenging process. Just think for a moment……. How different would you life be if you had a more healthy relationship to food? How would it be to know when you are feeling full and be able to simply stop eating? Can you imagine feeling in control of what you eat rather than food controlling you? If you are ready to be free of your addictive relationship to food then I invite you to a free initial consultation.